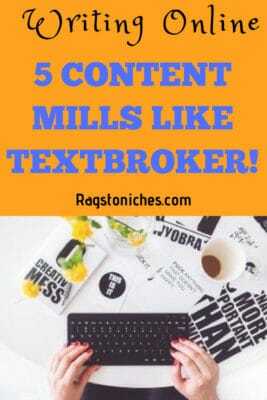 Are there any other Content Mills like Textbroker? Content mills have been labelled by many writing critics as the sub-basement of the writing world. Low pay, unreasonable clients, and low skilled writers are three of the more common complaints about content mill websites. But despite the critics, content mill writing has been an acceptable way for many non-professional writers to make some extra money by pursuing their interest in writing. You likely won’t retire doing content mill writing, but with a basic writing skill level you can explore a path to gradually making more money over time. Many people are familiar with Textbroker.com because it is one of the longest running content mills that have provided writers with the opportunity to make a few bucks along the way. 10 legit ways you can make money writing online. 6 ways you can make money writing product reviews. Hirewriters has a number of unique features about it – some good, some bad. On the good side is that you can line up jobs and get to them according to your schedule. With Textbroker; you take a job, then have to complete it before taking another job. Hirewriters lets you keep your writing queue full and this means that you don’t lose out on potential jobs just because you’re in the middle of another. Another perk is clients can pay you bonuses if they really like your work, up to $20. On the downside there is a penalty assessed if you miss a job deadline. Miss too many deadlines and you will find your skill level taking a hit. From one perspective, it is what entry level writers expect from a content mill: do the work, on time, with an acceptable level of quality, and you will get paid for your efforts. If you’re keen on a Textbroker alternative, this is a decent option to check out. For those new to the online writing industry, Upwork is the merger of two former content mill competitors: Elance and oDesk. Both had solid reputations in the industry, but it may speak volumes about how things really work when competitors merge. While this isn’t a “content mill,” in the typical sense, again it is a place where many people hope to pay a small amount for written work. It has one of the better reputations with those that do work with content mills and there is the opportunity to meet new clients and go for higher paying gigs in time. On this platform, writers usually bid for available jobs, and clients base their decision on the offered price and the resume of the writer. This can make it difficult for new writers to get a foothold, so patience is required. Still, Upwork is one of the most popular websites for new writers and some writers do manage to demand decent pay for their efforts. As a Freelancer, it shouldn’t be overlooked. If you have a solid profile set up, you can also get clients approach you for work directly. iWriter has been around about the same as the former oDesk and Elance mills. It does have a pretty negative reputation from writers themselves and the quality that is produced has been criticised by many. On the writer end of things, it functions like most content mills, where clients post their jobs and asking price and writers have at it. One of the important differences with iWriter is clients can, and often do, ask for one hour turnaround time. So if you compare it to say Hirewriters, you can forget about scheduling your own writing assignments. It’s like fast food takeout through the drive through window. A lot of clients seem to complain about the quality of the writers, so if you are a competent writer – you could be favorited and then be asked for personally and build up a client base. A great difficulty with iwriter is getting your first jobs. As you start off at an entry level and there are hardly any jobs available at this stage. You can pay to do a course at iwriter that will propel you to a higher level, where jobs will be available. However, that course currently costs $199 and with the low pay, it would take you a long time to recuperate that investment. Fiverr is a great platform, but the quality of writing you can find here is often not good. If you’re a good writer, you may be able to charge more of a premium and do well. Fiverr is an online freelancing platform and so, it’s really a *content mill,* in the usual sense. However, it’s similar in the small amount you can get paid just starting out. The potential client with a content mill sets the price, and it doesn’t take into account any research or rewrites you may have to do. But with Fiverr, the idea is to offer writing, (and many other services) for a small price, which is technically what a content mill does as well. The difference is, as you progress at Fiverr, you have the ability to add “gig extras,” and charge much more. There is a lot of competition on Fiverr these days, especially for things like Freelance writing. So, you’d have to make an effort to really stand out. It’s been said that people who have a video of themselves discussing their particular service, have a far greater chance of success. So, if you aren’t camera shy – this would be a very good idea. You also have the ability to charge different prices depending on things such as, the length of the article. So, you could charge $5 for just 300 words and then people would need to purchase additional gigs for more. You will need to price your skills competitively at first though, as Fiverr is very much dependent on customer reviews. You will want to get some good reviews at first and build your reputation from there. Joining Fiverr is completely free and, unlike some content mills, you don’t need to complete any tests to get started. One of the unique features of WriterAccess is when you go to their home page you find a series of downloadable e-e-books giving advice to clients about what they need to get the best deal. This is actually just covert advertising, but for clients who are looking for cheap writing there is no reason not to give the freebies a gander. Writers can get a clue from this, since if a website is telling clients how to get the cheapest price, what does this tell the writer about the price they can expect to get paid? OK, this is a question that has neither a simple nor an easy answer. The best and most honest answer is – it depends. It depends on the number of times you have to rewrite an article, if at all. It also has to consider if you can make money above and beyond the base rate, which is usually $.01 per word or less. Here, the total for writing 500 words at $.01 would be $5. Yet at the Beginner levels in many content mills you will be getting paid $.003 or three tenths of a cent per word. That can be downright discouraging. It’s not unusual for clients to ask for a rewrite or editing your original work, and that will but into your actual pay rate. For example, if you agree to do a job for $5 and it takes 1 hour, you earn $5. But if the client requires changes and those changes take you an additional 30 minutes, then you actually make $5 for 90 minutes of work or $3.33 an hour. Some content mills give every writer a second chance for the client to accept the job via a rewrite. Others do not, which means you can spend an hour of your time expecting to make $5 and end up with $0 and a grumpy attitude to go along with it. Is Content Mill Writing For Me? Most website ads that offer ways to make money working online include freelance writing. The more important qualifying question is whether you should take the plunge. There is no sense in stressing out trying to make some extra money that will only be spent on therapists or medical doctors working to significantly reduce your stress levels created by writing. There are some people who try to use it as a way to pay the rent – not a good idea in content mill world!. Practically speaking, it will take months or even years for you to reach the level of rent level income from content mills, if you can ever do it. But it is a good way to try and improve your writing skills beyond knowing the nuts and bolts of spelling and grammar. You can get a wide variety of jobs, everything from blogs to content pages for websites to public relations releases to product descriptions that will be found on Amazon and other high traffic websites. You may not be famous but it is very likely you will find your work out on the web somewhere. Those who have been told they are good writers and aren’t doing anything about it. People who like expressing their ideas. Poetry writers (yes, there are content mills that ask for poetry content – believe it or not!). The most direct advice is…. To simply try. You won’t know until you try, and you can make a little bit of money for trying. If you find out your writing skills are above the average writer out there, then you can put the pedal to the metal and see how fast and far you can go with your newly discovered talent. Ask yourself how you would respond if someone said that to you about writing for content mills or anyone else. Beyond Content Mills – a side-note from the website owner! This article was actually outsourced from Hirewriters and I’ve found the best quality writing by far now on this platform. If you would like to earn more online for your talents in the long run, your best bet is building your OWN online business. I have often wondered just how lucrative it might be to write as a freelancer. But I can see from this that it is both a competitive and decidedly underpaid way to make some extra money. I think I may be better off putting that effort back into my own website. What do you think? Hey Howard – sure building your website or blog is a great way to make money in the long term, (as long as you stick with it!). But it can take a long time to start making money from. So, a lot of bloggers/website owners start freelancing as a way to make money in the meantime. In fact, there are plenty of bloggers who exceed their income from freelancing in the end anyway. So, while the content mills aren’t the best place to make money freelancing, it’s a way that some people may feel comfortable getting their feet wet initially and seeing what it is like. Then perhaps they will feel more confident directly making contacts. I really like Fiverr, although I’m not a writer on fiverr, I have made $100 on fiverr in just two months. It starts slow but after I’ve gained some positive reviews people will start to contact you very often. Never tried to be a writer but it seems to be a good idea to start. Hey Daniel – good to hear you’ve done well on Fiverr… what service are you providing? Writing gigs on Fiverr are pretty competitive I think. Although, people who have a video on their sales page seem to do well. After reading your post I sort of became discouraged to take up writing as a way to make money online. Seems to be a lot of work for not a lot of money. But you did give me one idea. I am often struggling to create content for my site and using content mills might be a great idea to add content to my site without writing myself (just like you did with this post. I also agree with you that starting your own business is the best way to make money online. It can give you far more revenue for less work. Hey Jojo – it’s not very much money, but it can be a way for writers to get started. Also, I do know plenty of bloggers that end up exceeding their blog income with freelance writing and I guess this way could be a way of trying it out. Some writers can really get content written incredibly quickly, so they can make a decent sum, even with content mills. Yes, I’ve started purchasing writing now and again and I’ve found hirewriters the best so far – for quality. Thanks for taking the time to comment!